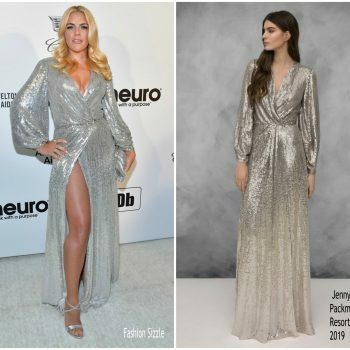 Busy Philipps wore a silver Jenny Packman Resort 2019 embellished gown to the 2019 Elton John AIDS Foundation Academy Awards Viewing Party. 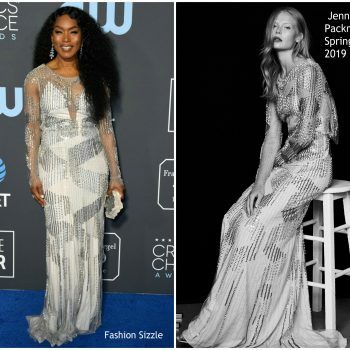 Angela Bassett 2019 Critics Chois Awards on Sunday (January 13) at the Barker Hangar in Santa Monica, Ca She wore a silver Jenny Packman Spring 2019 gown. 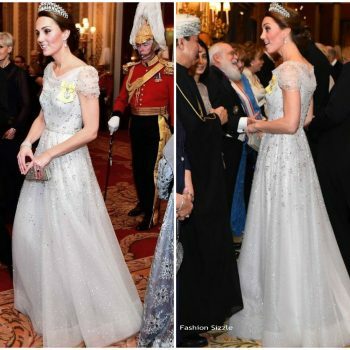 Catherine, Duchess of Cambridge and The royal family welcomed guests to the annual white tie Diplomatic Corps reception at Buckingham Palace on Tuesday (December 4). 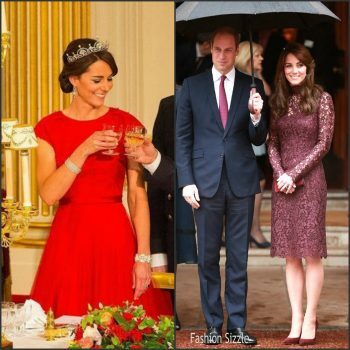 Catherine, Duchess of Cambridge wore a Jenny Packham gown. Emily Mortimer was in attendance at the premiere of her latest film, ‘Mary Poppins Returns’ on Thursday (November 29) in Los Angeles, California. 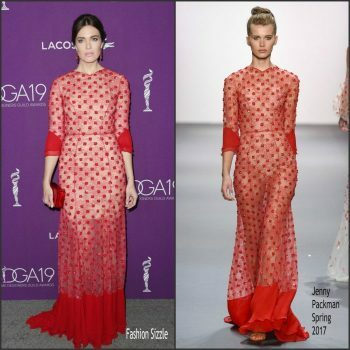 She wore a Jenny Packham Spring 2019 outfit. Julianne Hough was in attendance along with Lady Gaga on the red carpet on Monday (September 25) for the LA premiere of ‘A Star Is Born.’ She wore a white Jenny Packham suit. 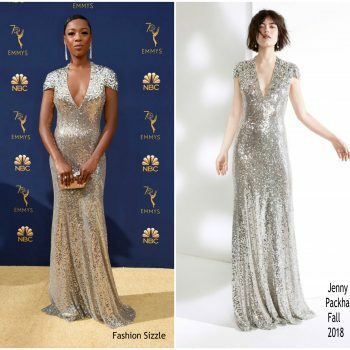 Samira Wiley was in attendance at 2018 Emmy Awards on Monday (September 17) in LA. 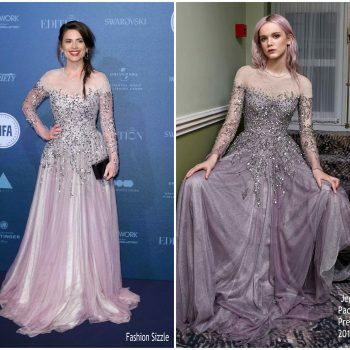 She wore a Jenny Packham Fall 2018 "Apollo" silver embellished gown . 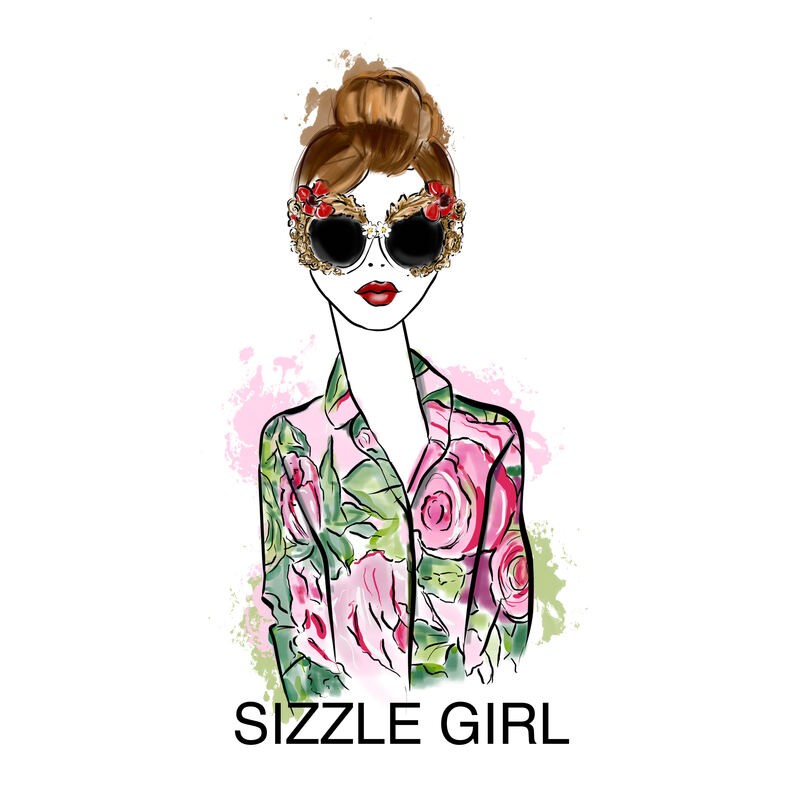 Catherine, Duchess of Cambridge was in attendance along with Meghan, Duchess of Sussex at Wimbledon on Saturday (July 14) Catherine, wore a Jenny Packham printed dress styled with a Dolce & Gabbana top handle bag. 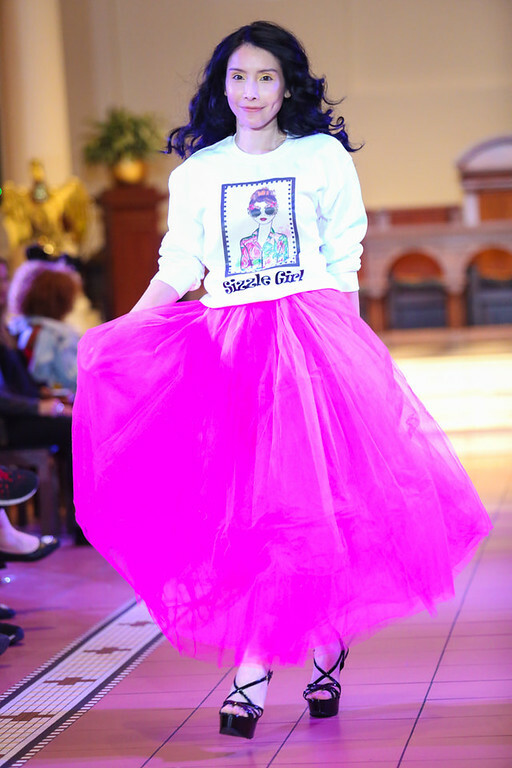 Lydia Hearst attended the LA premiere of ‘SOLO: A Star Wars Story’ on Thursday (May 10). 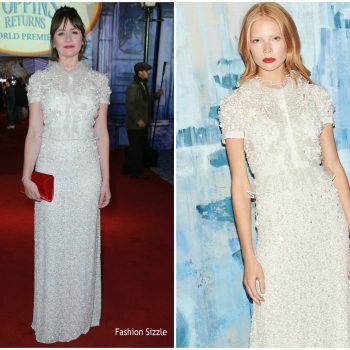 She wore a Jenny Packham embroidered evening dress. 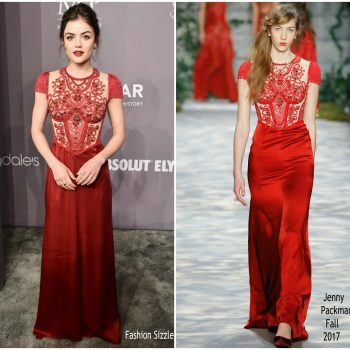 Lucy Hale was also in attendance a at the 2018 amfAR Gala New York on Wednesday (February 7) She is wearing a red Jenny Packham Fall 2017 gown. Hayley Atwell attended The British Independent Film Awards held at Old Billingsgate on December 10, 2017 in London, England. 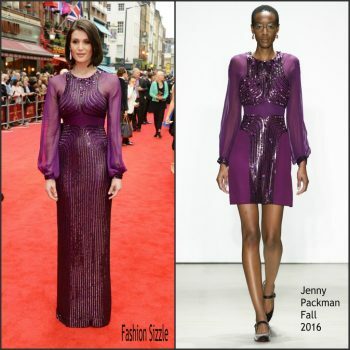 She wore a Jenny Packham Pre-Fall 2017 lavender tulle gown with sequin and crystal embellishments. 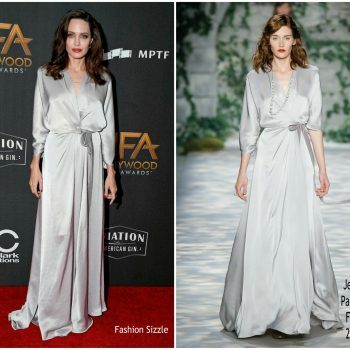 Angelina Jolie attended the 2017 Hollywood Film Awards on Sunday (November 5) in Beverly Hills, California. 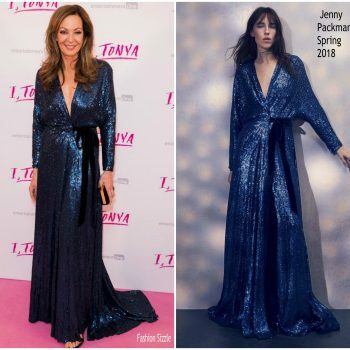 She wore a silver satin like Jenny Packham Fall 2017 gown. 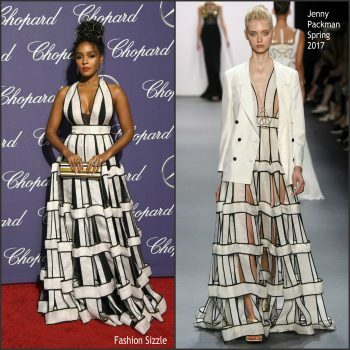 Tracee Ellis Ross posed on the redcarpet with designer Jeremy Scott at the amfAR Gala Cannes on Thursday (May 25) during the Cannes Film Festival. 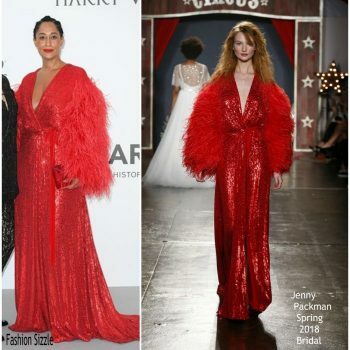 She wore a red Jenny Packham Spring 2018 Bridal outfit. 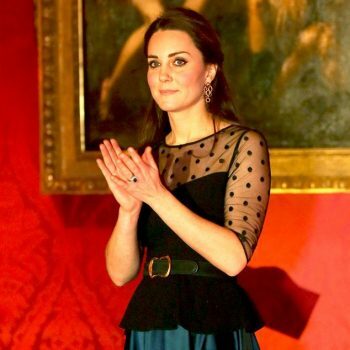 Duke and Duchess were in attendance at a dinner at the ambassador's residence in Paris on March 17, 2017 She is wearing a pale blue-green Jenny Packham gown for dinner at the ambassador's residence. 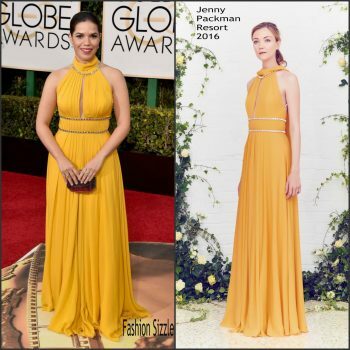 Mandy Moore attended the 2017 Costume Designers Guild Awards on Tuesday (February 21) at the Beverly Hilton Hotel in Beverly Hills, Calif. She wore a red embroidered Jenny Packham Spring 2017 gown. 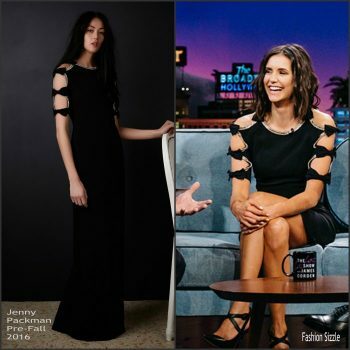 Nina Dobrev wore a black Jenny Packham Pre-Fall 2016 dress with bow cut-out detail on the Late Late Show. Janelle Monáe attended the Palm Springs Film Festival Film Awards Gala. 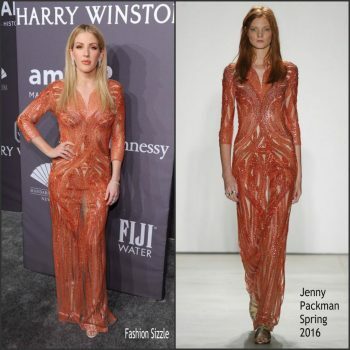 She wore a Jenny Packham Spring 2017 gown. J.K. Rowling was in attendace at the European premiere.of Fantastic Beasts at Leicester Square, in London. 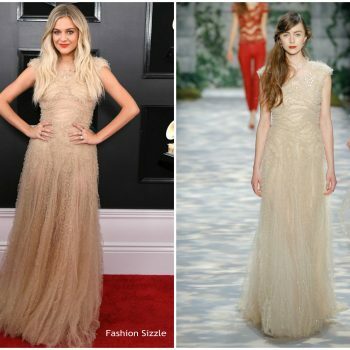 He wore a Jenny Packham Pre-Fall 2015 champagne gold sequin-embellished gown. Jennifer Garner attended the 50th annual CMA Awards at the Bridgestone Arena on November 2, 2016 in Nashville, Tennessee. 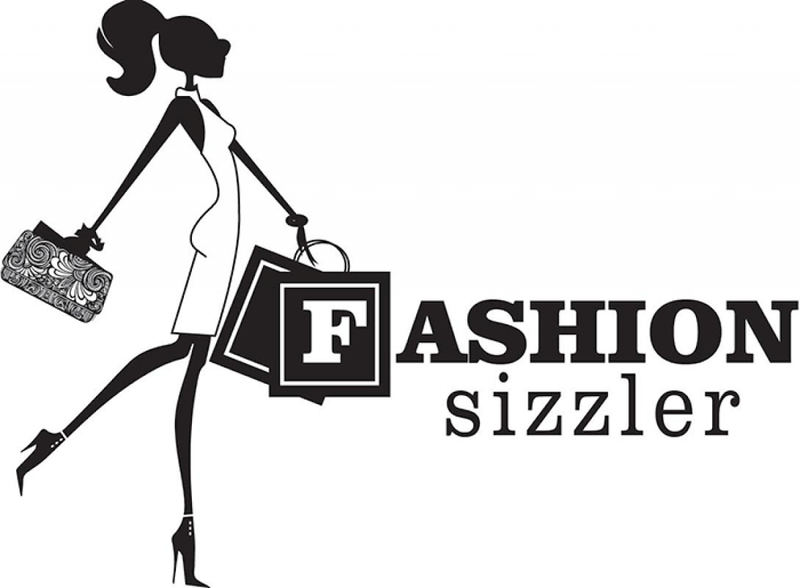 She wore a Jenny Packham black strapless gown with a gold embroidered bodice. Actress Gugu Mbatha-Raw attends the premiere of 'Free State of Jones' at DGA Theater on June 21, 2016 in Los Angeles, California. Christina Hendricks attends ‘The Neon Demon’ Los Angeles Premiere at Cinespia on June 14, 2016 in Hollywood, California. Gemma Arterton attended the 2016 Olivier Awards which was held at The Royal Opera House in London.